If you have large PDF files greater than 2MB, you will need to host them somewhere. 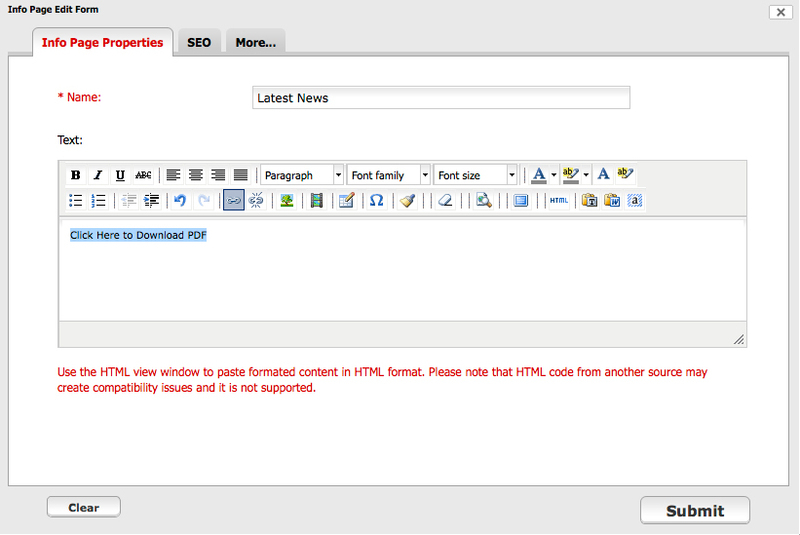 One option is FolioLink’s cloud hosting service. FolioLink’s cloud hosting gives you the ability to upload virtually unlimited files as large as 200MB. 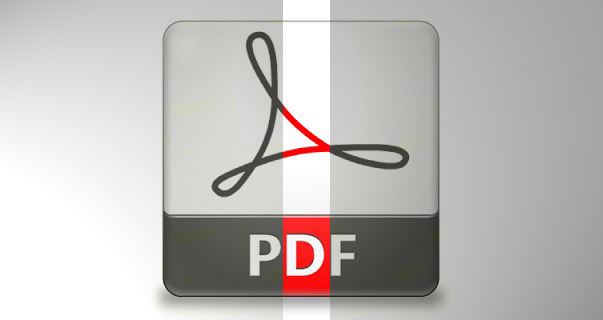 Follow these step-by-step instructions to link your large PDF files. 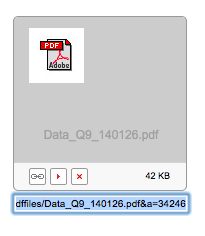 1) Upload your large PDF file. You may already have a file hosting solution for this purpose. If you do, you will need to get the file hosted address (i.e. domain.com/files/mylargepdffile.pdf). 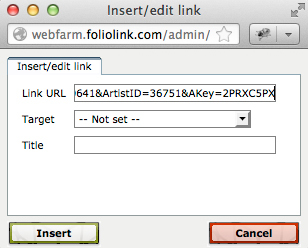 If you do not have a way to host large files, the FolioLink cloud option works as follows. 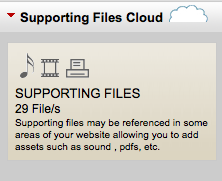 1a) Upload your large PDF file to your cloud driven Supporting Files area. 2) Once you have uploaded the file, you will see a thumbnail with a link button as the one shown below. Click on the link icon. 4a) Click the pencil icon to edit your Info Page. 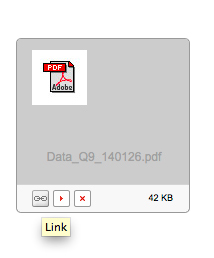 4b) In the Info page edit form, type in a label for the PDF link (Example: “Click Here to Download PDF”). 4c) Then highlight the label text. 4d) In the menu bar above your text, click on the icon that looks like a chain link. 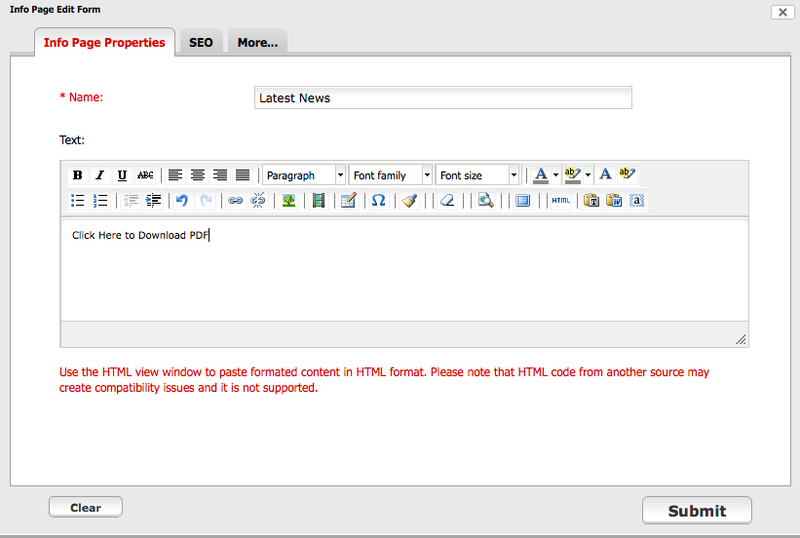 4e) Paste the URL address for your PDF file into the URL address bar (Link URL). 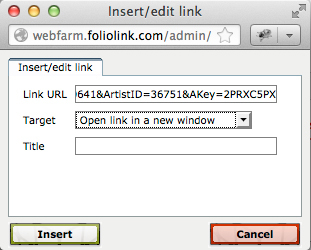 4f) Then click on the Target drop-down menu and select “Open link in a new window”. 4h) Click Submit at the bottom of the Info page form to save your changes. NOTE: You can follow these same instructions to add a PDF link to any of your text areas including Front Page text and Portfolio/ Image descriptions.